Mykonos island is one of the most picturesque Greek islands we (me and Bruno) had a chance to visit recently, together with a group of friends. There are a lot of photos of the island on Instagram and other social media platforms. Even though I have seen an endless amount of photos and videos of Mykonos before going there, the island still managed to surprise me with its beauty and the variety of things you can do there. 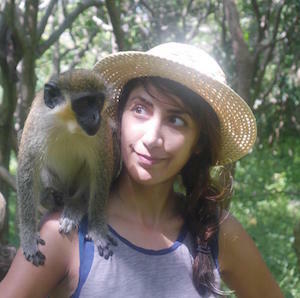 In this article, I am going to share what I think are the top 10 things you can do when you are in this windy, but pretty, island. Most of the photos you see on Instagram are taken in the Hóra town, the main town in Mykonos. The best way to explore the town is strolling around and get lost in its narrow alleys while enjoying watching the white buildings decorated by bougainvilleas. You can find cafes, bars, and restaurant in every corner where you can have a short break and have a coffee, ice cream or a drink while appreciating the beauty of your surroundings. Make sure while roaming around to plan a visit to “Little Venice”, the most picturesque spot in Mykonos. Little Venice is a seaside place with 18th-century fishing houses right at the edge of the water. As you can guess this place took its name from the famous city of Venice in Italy, because of some resemblance. Currently, the old fishing houses are colourful restaurants and cafes with waterfront balconies, where you can dine with a stunning view of the sea. 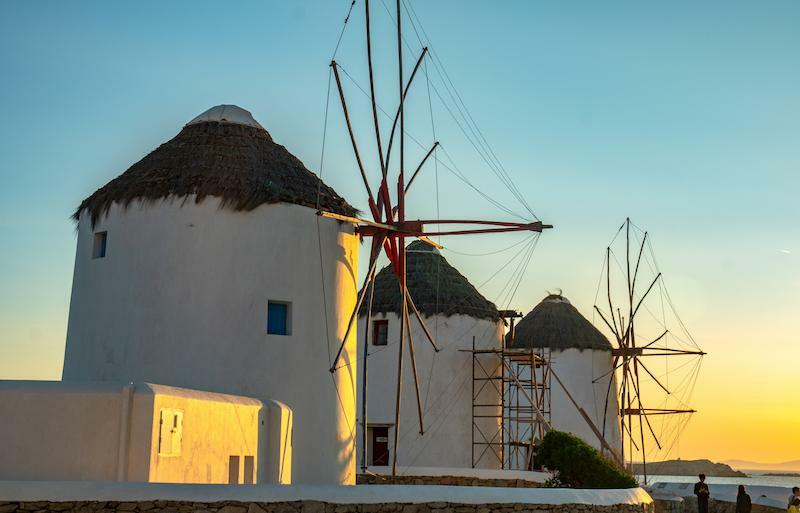 After visiting the town and Little Venice, you can take a path to the popular windmills in Chora. I recommend you to walk up the hill because it offers amazing views of the Aegean sea. 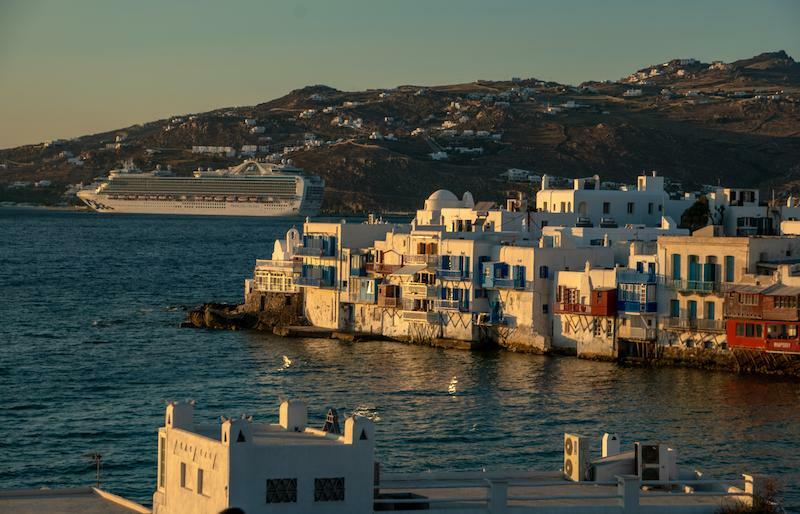 Little Venice and the windmills are the best spots to watch the sunsets in Mykonos. You should keep in mind that you won’t be alone. Most tourists gather in these places to watch the sunset, and so did we. I must confess that it was one of the most amazing sunsets we have ever seen. The white buildings and blue doors in Mykonos are a great combination as a background for your photos. You can walk through the town and find a lot of instagrammable spots. The town is not really big so walking around won't make you tired, you can put on a nice dress for a photo and add fantastic posts to your Instagram feed. 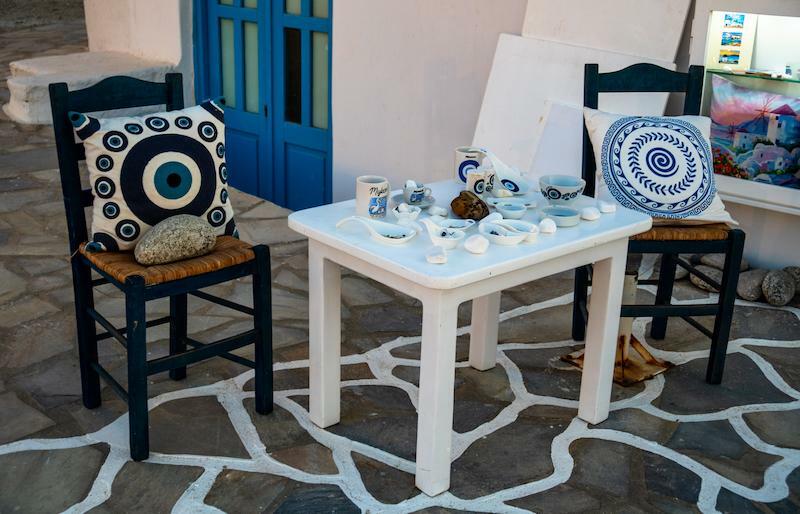 If you are, like me, always up for some shopping when visiting a new destination, Mykonos could be the right place for you. Apart from some well-known street brands and luxury boutiques, there are various interesting local shops selling handmade jewelry, leather goods, paintings and unique souvenirs. Mykonos is one of the most popular Greek destinations for partying and a lively nightlife. 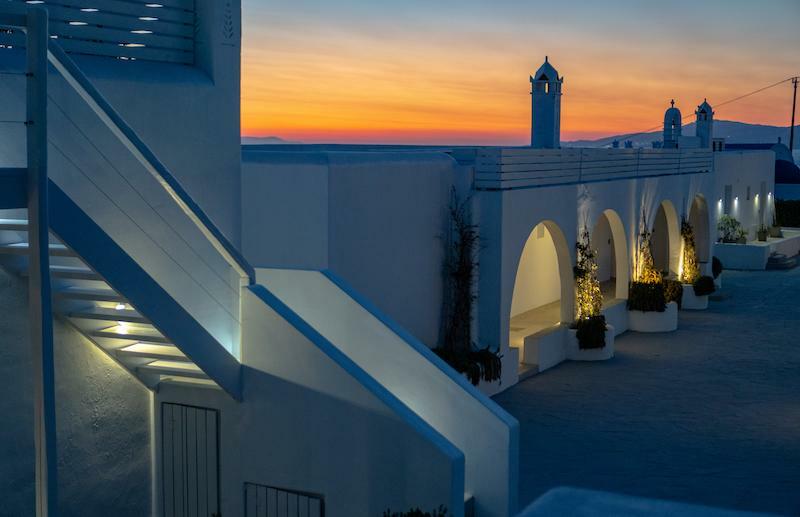 If you are searching for a fun experience and a happy atmosphere, then Mykonos is the right place to be in. The nightlife in Mykonos is quite varied since the island is popular amongst the various type of tourists including celebrities, young generations, and homosexuals. For these reasons, your options are endless. You can head to a beach bar with DJs, go to an elegant nightclub or just go opt-in to some crazy nightlife. 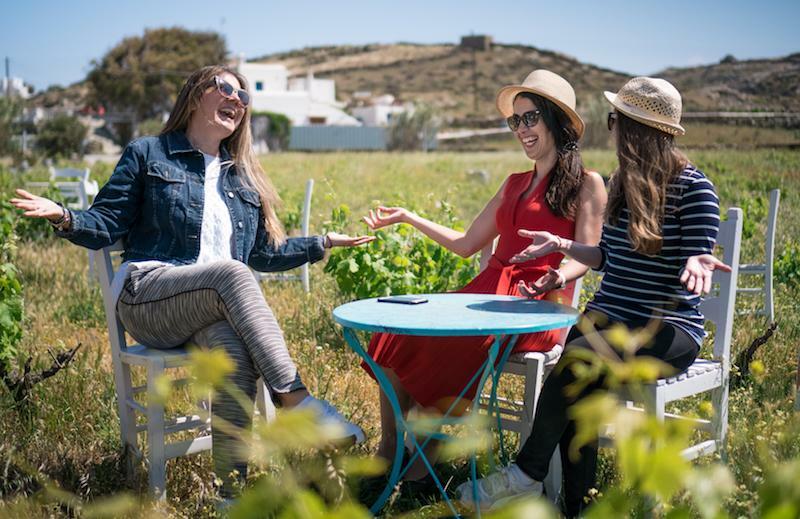 Mykonos is a dream destination for all types of travellers, it could be for a family trip, a solo trip, a romantic trip or travelling with friends. There are various hotels and villas offering a swimming pool with a sea view. This allows you to enjoy the scenery and some privacy at the same time. We stayed in a very spacious and beautiful villa: Villa Hurmuses, which not only offers a great view of the blue water but a swimming pool and big terraces. Going on a boat when you are on an Island is a must, Mykonos is no exception. We went for a day trip sailing around Mykonos with Mykonos on Board, it was such an amazing experience. We learned about the history of Delos and Rhenia, two inhabited islands near Mykonos while sailing through them. We were there in April when the water was not really warm enough for a swim, but I couldn’t resist the crystal clear water, so I jumped into the sea anyway. I should say that I am really glad I did it, because you can’t go on a sailing boat without going for a swim. Cycling is a fun way to explore hidden gems. I think you already know that I am a fan of cycling and finding off beaten tracks when I travel. So, when we were in Mykonos, we went on a tour with Yummy Pedals. Yummy provided us with bicycles, helmets and even a scarf for our heads for hygienic reasons. We went to some places we wouldn’t have been able to find by ourselves thanks to the tour. After our bike tour we went to the Vioma Organic Farm, which is surrounded by a beautiful vineyard and also offers wine tasting, and we all went for that. The farm has its own organic wine, honey, greengrocery and dairy products. If you are planning to visit Athens as well, you can read my other article: “In Athens: from the Acropolis to the lovely Riviera”.